While we looked at employment data last month, we would like to introduce some of the market sentiment indicators that we monitor. We believe monitoring sentiment is extremely important at the extremes “since financial markets are driven by fear, hope and greed, only loosely connected to the business cycle…” (as Jeff Saut, of Raymond James, often says). The VIX, aka the “fear index,” peaked in December and has been falling ever since. The VIX is often used a proxy for market sentiment (most notably fear). The VIX tagged 35 in December, a level only reached every few years. 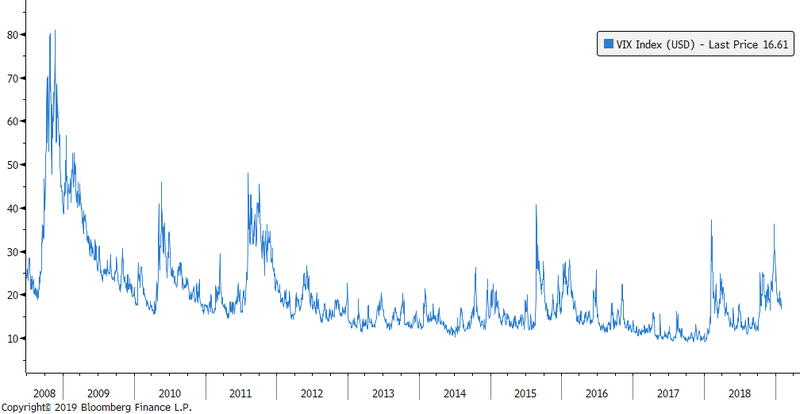 The VIX’s full name is the CBOE SPX Volatility Index and it is a measure of index options valuation; higher VIX values indicate higher options values, which imply higher expected volatility in the indices. As is often the case, different pieces of data provide different signals. The below is the VVIX, which approximates the valuation of options on the VIX index itself. After a blow-off top in February, it peaked again in October. The VVIX clearly did not anticipate the further deterioration in market prices in November and December. Credit spreads on corporate bonds also widened in Q4. Similar to the VIX, credit spreads hit multi-year highs in December, but have been falling throughout January. Credit spreads are the additional yield that investors demand for owning riskier bonds. Higher perceived risk drives credit spreads higher. The below shows the number of stocks on the NYSE that hit new 52-week lows. Again, this indicator peaked in late December. This next chart shows the number of stocks on the NYSE that hit new 52-week highs. It is a noisy dataset, but it is clear that there were very few new highs in Q4. Our last chart shows the number of stocks on the NYSE that hit 52-week highs versus the number that hit 52-week lows. Similar to the previous charts, this figure hit multi-year lows in December, before bouncing back. While indicators like the VVIX and NYSE 52-week highs are a bit noisier and more ambiguous, we believe it is safe to say that market prices and fear hit extremes in December 2018. We have witnessed a rapid snapback in January, although indicators like the VIX and credit spreads appear to have further room to fall.